For the second year in a row, we attended the annual Vendy Awards, a competition and cook-off among the best NYC street vendors, all in benefit of The Street Vendor Project. The Street Vendor Project is a non-profit membership based organization that provides street vendors all over NYC with resources, support, and legal advice. To find out more about this awesome Project, visit (http://streetvendor.org/). There are over 10,000 street vendors in NYC alone (I dare you to visit all of them! ), and this includes both food and non-food vendors such as flowers, crafts etc. At the Vendy Awards, we got to sample the best from the top food trucks as rated by eaters. Here are some of my personal highlights. Let me start off by saying that I think soft serve vanilla ice cream is one of the best, most perfect, THINGS (not even just food!) ever. Sometimes, I prefer soft serve ice cream, especially in a light and crispy wafer cone. Back in the day, way way back, I had my first job at Carvel, and that's when the love for vanilla soft serve really.... well... blossomed. I ate alot of it, enough said. Anyways, The Big Gay Ice Cream Truck serves a super smooth and creamy vanilla soft serve, along with some creative gourmet-like toppings. Sorry Mr. Softy, you just can't compare. I don't even think Carvel can compare... but I feel guilty for even saying that. 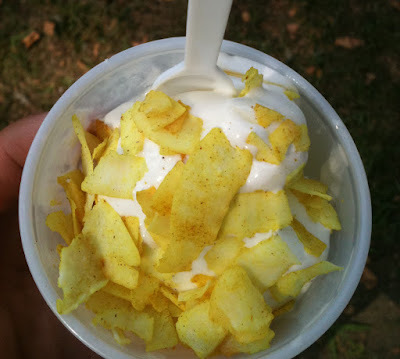 Pictured below is a little sample of the ice cream that's topped with ginger syrup and coconut flakes! Another perfect thing is coconut...but that's a topic for another time. This was a delicious sample that eased my appetite until later...when I stood in a very very long line to try ice cream on a wafer cone with crushed wasabi peas! Sadly I don't have a picture :( The wasabi peas on the ice cream was pretty good, would have enjoyed a little more flavor as the peas were quite mild, but it was definitely worth trying. Janet and I are both Chinese, obviously we love dumplings/potstickers, and our expectations are very high. Nothing quite compares to the home cooking we both get from our families, however, we were very impressed with the potstickers at A-Pou's Taste. The potstickers are pan fried until they almost stick together and crisp up. YUM! 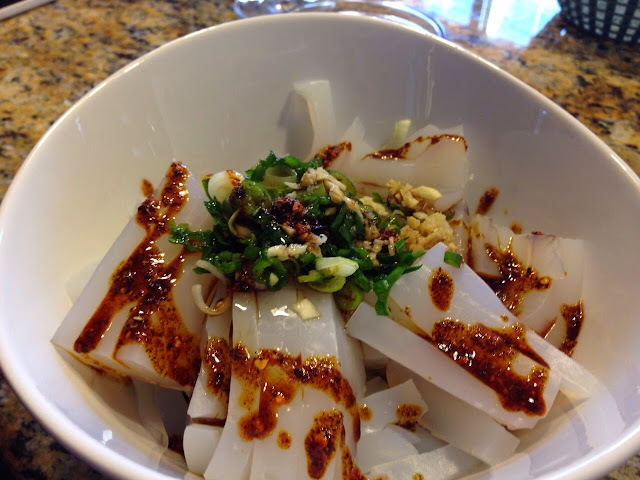 The pork filling is flavorful and actually tastes like the way a dumpling should taste. I like these guys because they are no-frills and not fancy. It seems like there are now dumpling shops trying to be gourmet, seriously...it's not a dumpling "bar", and one dumpling should not cost $1. At A-Pou's, for $6 you can get 10, or you can get 5 + noodles (noodles!). In addition to the potstickers, A-Pou's offers some soups and sides. I spoke with one eater who raved about the corn soup, but I didn't get to try it. So if you get the chance to go, don't forget the soup! 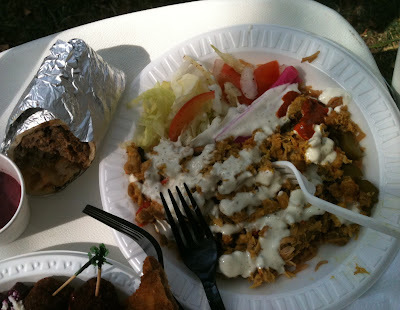 This was one of my favorite things at the Vendy's this year, and it happened to be Patacon Pisao's specialty. Patacones, are sandwiches made with flattened deep fried plantains as the bread. I love plantains, and have never had it served this way before. And ohhhh man was it delicious. The plantain is pounded flat just like flatbread and nicely fried (possibly twice). It's got a crispy crust and surprisingly holds together as you eat the sandwich. Aside from the plantain, the fillings were super flavorful as well. You can choose from a variety of succulent meats, topped with salsa, lettuce, tomatoes, and of course some kind of special sauce that is just so damn special. Patacon Pisao started off as a truck in 2005 and now has permanent locations in Washington Heights and Elmhurst, Queens. I would end with "next time you're in the neighborhood....", but I really think this is more suited for, get up and GO TO this sandwich! You'll be happy you did! The winner of the 2010 Vendy Awards! This is what street meat is all about, and when you try it, you will have no choice but to say yes! The chicken and rice platter is one of the best in the city. I'm still partial to the Manhattan 56th and 6th ave. cart, but will admit that this chicken and rice is absolutely delicious. What I enjoyed the most were the falafels. Seriously, these guys were not kidding when they named themselves King of Falafel. There are middle eastern restaurants all over NYC, but I this is the best falafel ever! The falafels have a smooth consistency, are really well seasoned, and perfectly fried. I enjoy them because they are smaller in size and can fry up faster without drying. They also come in a little oval shape, which is perfect for dipping! If you need another reason to go to Astoria, this is it! 1. It's far cleaner than eating at most restaurants. The food is made right in front of your eyes, instead of a dirty kitchen. 5. If you can't tell from this post, it's DELICIOUS!